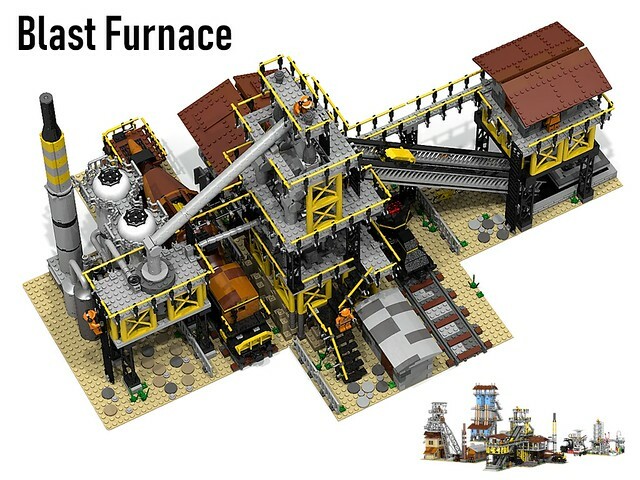 I built a big blast furnace a while ago, based on Landschaftspark Duisburg-Nord (Germany) and Horno Alto 1 de Altos Hornos de Vizcaya (Spain), and quite a few people asked for instructions to build it. That model has about 13k bricks, far too much for LEGO Ideas, so I decided to make a smaller version. Raw materials (iron ore, cokes, limestone) are hauled up a ramp in a container by a winch. The contents are then dropped into the furnace/oven. The melting produces hot gasses which are collected on the top of the furnace and transported to a dustcollector/scrubber to remove the particles. The collected dust is transported away by truck. The remaining gas is re-used as fuel for the hot air towers. At the base of the furnace are two exits. 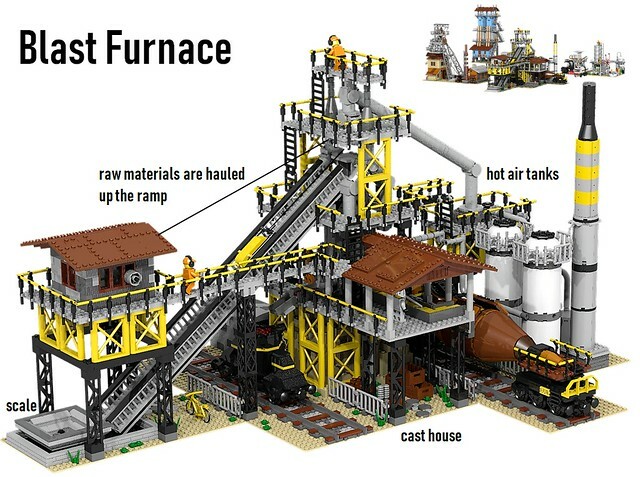 The slightly higher located one is to extract the waste product, the slag. This flows into a slag ladle for further transport. Slag is often used for driveways. The lower located exit is used for the molten iron which flows to the torpedo wagon. It is then transported to an iron mill for further processing.